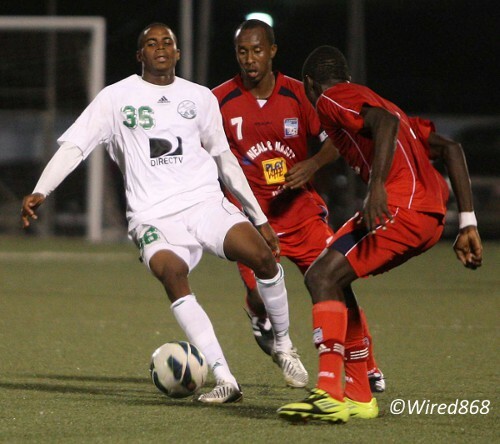 Another match and another masterpiece from DIRECTV W Connection star Joevin Jones as the “Savonetta Boys” strolled past defending Caribbean champions Neal & Massy Caledonia and virtually booked their place in the 2013/14 CONCACAF Champions League yesterday evening with a 4-0 dismantling of their Pro League rival. 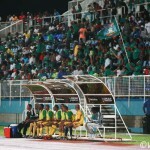 Connection owner David John Williams was an anxious figure before kick off as his team faced an outfit that enjoys a seven point gap over his squad in the domestic competition. But he need not have worried. 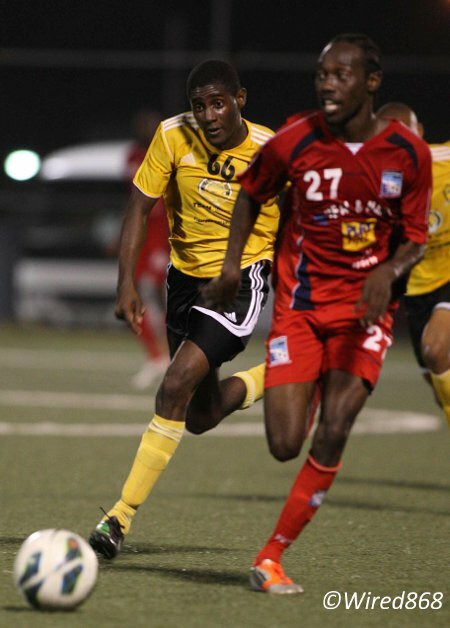 The game was over after five minutes when Jones’ hammer of a left foot knocked the wind out of the Morvant/Laventille team for the second time in seven days. Photo: W Connection star Joevin Jones (right) is congratulated by teammate Silvio Spann (centre) while Kurt Frederick (left) looks on. Caledonia plays again from 5 pm tomorrow at the same venue against Antigua Barracudas and must significantly lift its performance to have any chance of finishing second and getting the play-off spot available. Beleaguered politician and former football administrator Jack Warner boasted, on Thursday night, that he can walk comfortably through central Trinidad or the tough streets of Laventille without fear. On yesterday’s evidence, so can most the Connection team. Surinamese attacker Stefano Rijssel might not understand what all the fuss is about. 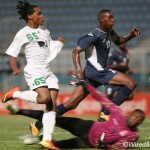 In the 89th minute, Rijssel motored down nearly half of Caledonia’s right flank, with defender Aquil Selby serving as a tour guide, cut inside the penalty area and lashed a firm, angled drive that squirmed under Grenadian goalkeeper Shemel Louison for Connection’s fourth and final item. He might have a tougher time with pedestrian traffic at Trincity Mall. It summed up an abject, lifeless display by Caledonia. The “Eastern Stallions” were clearly even giving away free rides. 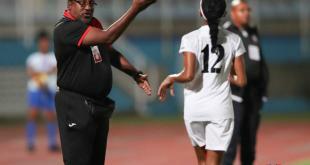 “Soca Warriors” joint head coach Jamaal Shabazz should have returned to the Caledonia bench yesterday after inconclusive talks with Trinidad and Tobago Football Federation (TTFF) president Raymond Tim Kee meant that the national technical staff remains without a contract for the foreseeable future. However, a family emergency forced Shabazz to miss most of the game yesterday. That was a pity. Jones gave another example as to why the national’s team insistence on shackling the 21-year-old to the left back or left wing positions for his country borders on treason. Jones might lack Densill Theobald’s on-field personality or Ataullah Guerra’s aggression on the ball. He does not strut like Marvin Oliver or marshall the midfield like Trent Noel. 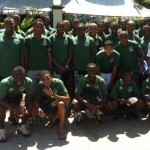 There is a detachment to Jones’ game that Connection coach Stuart Charles-Fevrier has harnessed brilliantly. He is neither midfielder nor forward nor anything else; just a fine, clever and composed footballer. Jones is like the supermarket supervisor who ambles around without an obvious task until a cashier needs to reverse a payment or a customer cannot find the bottled water. If a Connection player is not sure about what to do next. He passes to Jones. The “number 36” invariably figures it out. Seven days earlier, Jones scored a double as Connection dumped Caledonia from the Lucozade Sport Goal Shield. And it was quickly evident that the Morvant/Laventille team had still not recovered mentally. Five minutes into the match, Jones collected the ball just inside the Caledonia penalty area and the hulking figures of opposing defenders Nuru Muhammad and Selby seemed to shrink as they backed away. Jones passed to his right for Hashim Arcia and wheeled away towards the penalty spot. Arcia dragged the ball across the Caledonia box and there was the slender midfielder again. Jones let the ball run across his body and steadied himself in the wet conditions before blasted into Louison’s top right hand corner. Caledonia striker Jamal Gay had a sight of goal, in the 16th minute, after outmuscling Daneil Cyrus inside the opposing box but failed to get his angled shot past Connection’s Colombian custodian Alejandro Figueroa. Otherwise, Caledonia spent much of the first half hour on the back foot. Cyrus popped a free header over the bar from a Rijssell cross in the 21st minute. Then, five minutes later, it took a brilliant defensive double save from Louison and Kareem Joseph to deny Andrei Pacheco and Jones. From the resulting corner, though, the Caledonia defence was criminally negligent as Pacheco rose unchallenged, between three defenders, to nod home Clyde Leon’s corner kick. Stung, Caledonia did respond with a brief offensive flurry as Nathan Lewis and Joseph both provoked fine, flying saves from Figueroa. But Jones also came close to widening Connection’s advantage with a curling free kick and attempted lob before the interval. Photo: Caledonia AIA winger Nathan Lewis (right) glides past T&TEC FC defender Antuan John in a previous Pro League fixture. Caledonia introduced Theobald, who was recovering from a knock, early in the second half and he almost made an immediate impact with a snap shot that was again competently matched by the flying Figueroa. But the Stallions never appeared capable of breaking Connection’s stranglehold of the midfield area and Leon could not have looked more comfortable if he was wearing fluffy bathroom slippers. In the final 10 minutes, the Savonetta Boys turned a comfortable procession into a rout. Again Jones, who had moved into the “false number nine” position, led his teammates by example. Rijssel, who has come into his own this year, slipped Jones clear and the latter player further demoralised Caledonia with a clever dink that bounced softly over the goalline for the third item. It was his sixth goal from four successive matches and his eighth from his last seven games. Rijssel, suitably inspired, rounded off the score summary with a solo effort for Connection’s fourth item. 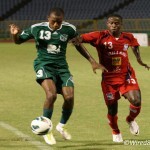 Caledonia must defend its turf more aggressively tomorrow if the Stallions are to return to the CONCACAF stage for the second successive year. Thankfully, they will not have to face Jones again. 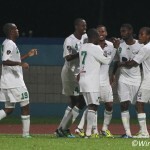 Neal & Massy Caledonia AIA (4-4-1-1 system): 1.Shemel Louison; 12.Kareem Joseph, 3.Nuru Muhammad, 5.Aquil Selby, 2.Aubrey David; 17.Akim Armstrong, 7.Stephan David (captain), 9.Keyon Edwards (22.Miguel Romeo 89), 27.Nathan Lewis; 26.Vurlon Mills (21.Densill Theobald 55); 23.Jamal Gay (18.Sherron Joseph 72). Unused substitutes: 33.Glenroy Samuel, 4.Colin Nelson, 15.Aaron Lester, 16.Odelle Armstrong, 20.Akeem Thomas. DIRECTV W Connection (4-2-1-3 system): 21.Alejandro Figueroa; 25.Christian Viveros, 4.Daneil Cyrus, 19.Joel Russell, 32.Kurt Frederick; 12.Gerrard Williams, 8.Clyde Leon (captain) (42.Tremain Paul 88); 36.Joevin Jones (vice-captain); 26.Stefano Rijssel (65.Neil Benjamin 90), 14.Hashim Arcia, 17.Andrei Pacheco (20.Silvio Spann 76). Unused substitutes: 22.Aquelius Sylvester, 5.Elijah Joseph, 29.Jomal Williams, 39.Alvin Jones.